Like last year's effort, if you can call it that, Field Day 2016 for WN1MB/1 was conducted from the comfort, peace, and quiet of the waterfront cottage on Winsted's Highland Lake. The equipment used was the same, too, with one exception: instead of batteries, the Ten Tec was powered from a homebrewed 12VDC 3A power supply I recently built. The inverted L was run a bit differently than last year. This time around it was a true inverted L. Last year the top "horizontal" section wasn't really horizontal but instead more sloping downward - kind of like half an inverted L and half an inverted V. Whatever. It tuned pretty much the same with the L network tuner. There were no grandiose targets or goals other than to just get on the air and have some fun. Though a 50 or 100 QSO target was briefly entertained, I just couldn't get with that program. So the only goal was to "have fun." And I'm happy to report that the goal was attained! There was no computer up at the cottage. Though I had contacted Charter Communications to see about temporarily transferring my account from the apartment to the cottage for the month I was there, they couldn't guarantee when transferred back that it would be the same "grandfathered" 3 Meg, low budget rate. So I quickly canned that idea. You can call it cheap - I'll call it frugal. 3 Meg works for me and is all I need, thank you very much. Truth be told, I did briefly entertain the thought of bringing up the computer even without Internet to do some "writing", file maintenance, and hard drive clean up. It was decided that the last thing I wanted to do was sit in front of a monitor like a zombie at a waterfront location. If I needed to sit and stare at something, there was a porch facing the lake! I took advantage of that for more hours than I care to admit to. Back to radio stuff: so computer logging was out. Instead, some pages in a spanking new one subject wireless notebook from Staples was used for logging, along with a trusty Dixon Ticonderoga 1388-2 pencil. Low tech all the way. And no effort was made to fashion up a dupe sheet - I didn't expect to make enough contacts to deem such complexity necessary. I was wrong, though, in that I did receive, and embarrassingly so, two or three "WN1MB B4" replies to my calls. heh. I started listening on 40 meters at 2 p.m. Saturday at the start of the event, though didn't log my first contact until 37 minutes later. 40 was jumping with activity. Though I did check 20 meters, which was also jumping, I stayed on 40. It was sad to hear 15 meters as dead as it was this year. So I just casually picked away at making contacts until about 6 p.m. At that point I had a whopping total of 16 contacts and 9 sections logged. As the sub-title says, "lazy fun." 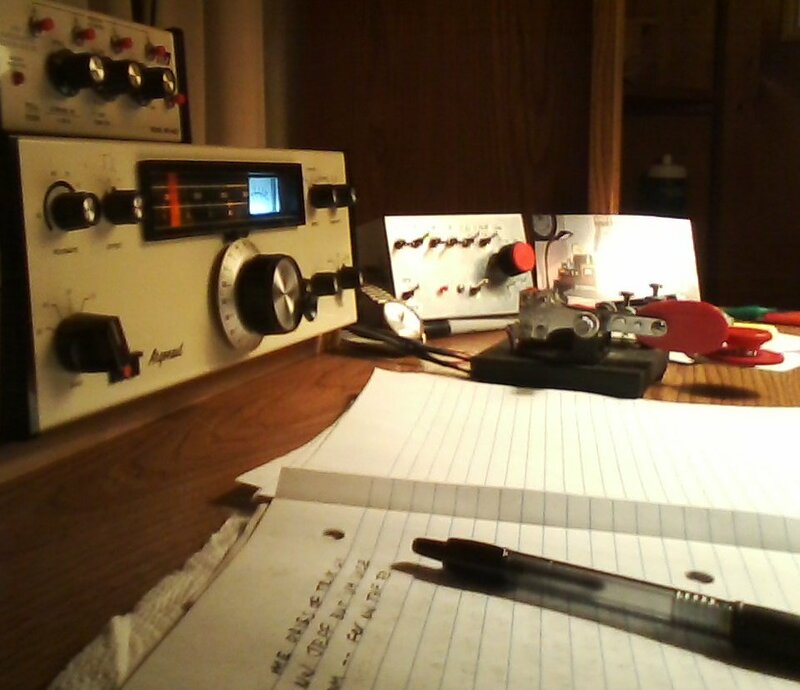 Between making and demolishing dinner, a bit of fishing, and then some reading, I didn't get back on the air until just before 11 p.m. making four more contacts on 40 meters. Thinking it might be nice to add some new sections that I couldn't hear or just weren't workable on 40 meters, I switched to 20 meters and was delighted to hear it was still very open and busy! 11:36 p.m. First contact on 20. California. 2,593 miles. One call. No repeats. Two watts QRP from a 44 year old radio. Cheap wire antenna and homebrew tuner. Wow. And that was the end of Saturday's effort as well as my one and only 20 meter contact for Field Day. I had traversed the North American continent, virtually coast to coast, with a low power, antique radio using an antique mode with an antique keying device, chronicled with an antique writing impliment in an antique logbook. It was late and this antique had nothing left to prove to himself or anyone else. Working W6YX was the pinnacle. So this antique turned off the power supply and went to bed. Got up at 6 a.m. and on the air at 7 a.m. I casually picked away at making contacts until around 9:30 a.m. Over the next hour and a half, 40 meters provided another 21 contacts and six more new sections. For whatever reason (laziness?) I took a break until 1:43 p.m. The band had thinned out pretty well by that point and I only added four more contacts and one more new section to the log. I pulled the plug at 2 p.m. having hit the 24 hour mark and called it a day - at least for hamming. The 2016 Just Some Lazy Fun Field Day "effort" yielded 46 contacts - down from last year's 67. As for sections, the log shows 19 worked - down from last year's 32. The states total was 16 - also down from last year's 24. These lower numbers in 2016 I attribute to two things: this was a very low key operation with no goal other than to have some lazy fun on the air, and all contacts with the exception of that lone 20 meter contact were made on 40 meters. So it was virtually a lazy, single band operation. Also, 15 meters was dead every time I checked it, so no Q's or distant sections were to be made on that band. All numbers weren't down, though. This year, 45 contacts were made on 40 meters - up from and significantly over last year's 25 Q's on 40. So there! A post-FD bonus was the next morning. After getting home from work and showering, I turned on the radio and tuned around 40 meters. Lo and behold, VK3SS was chatting with W6's on 40 meter SSB with a 5x6 to 5x7 signal. This truly amazed me, as VK3 is nearly the exact, geometric opposite side of the Earth from W1-land. I guess this silly inverted L, homebrew L network tuner, and antique radio really do work!